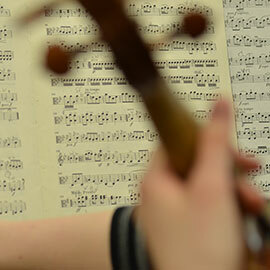 Laurier Symphony Orchestra and Wilfrid Laurier University Faculty of Music, in collaboration with NUMUS Concerts, invites emerging composers to enter this competition for the commissioned composition of A Concerto or Concerto-like work for Cello and Ensemble. Prize: $2,000 commission and a premiere performance by the Laurier Symphony Orchestra on the NUMUS Concerts 2015-2016 Series with Elinor Frey, solo cellist. Deadline for submissions: Sept. 1, 2015. Deadline for commissioned work: Dec. 1, 2015. Performance date: Jan. 29, 2016. Composers age 40 and younger as of Nov. 14, 2015 who are current residents of, were born in, or who have completed a substantial portion of their musical education in, Waterloo Region may enter. Applicants must not be currently enrolled in an undergraduate music program. Applicants must send three representative works, with recordings where available. Contact information of the applicant. Eligibility qualifications (age, Waterloo residency requirements, etc.). A very brief description of how the three submitted works relate to the proposed project. Electronic submissions (PDF, MP3) are welcome. The winner will be chosen by an independent jury. Submissions must be received no later than Sept. 1, 2015. The winner will be notified by Sept. 15, 2015. A commission for $2,000 (all inclusive) and a performance of the newly composed work at a Jan. 29, 2016 concert in Waterloo during the first Laurier New Music Festival. The winning composer must commit to completing a new work for cello soloist and ensemble, up to: 2222 4231 harp, keyboard, 3 percussion, strings (10 10 7 7 4) by Dec. 1, 2015, and to attend the premiere performance on Jan. 29, 2016. Full or partial travel assistance may be available. The duration of the submitted piece can only be a maximum of 10 minutes. Electronic submissions (in one folder please!) should be sent via Dropbox. For more information, contact Maria Kouznetsova at kouz8930@mylaurier.ca.